BeagleBone Black Robot Project: What is a BeagleBone Black? 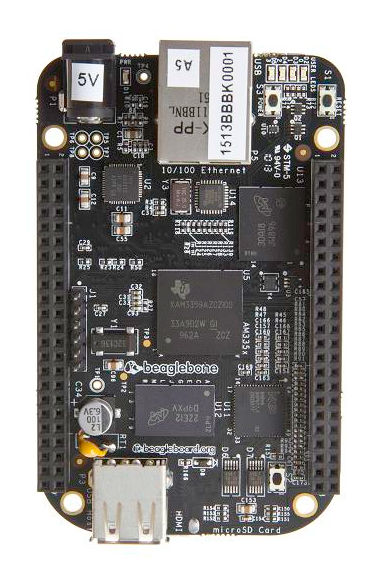 The BeagleBone Black (BBB) is an ARM community-supported development platform for developers and hobbyists. It comes pre-installed with Angstrom Linux but it is compatible with other operating systems like Ubuntu, and Android. While it can be used as a desktop computer its main advantage compared to similar boards is all the pins that are available to the user. That is just a little bit of information on the Beaglebone Black, check out the link below if you wish for more. Using the BeagleBones pulse width modulation (PWM) an analog-to-digital converter (ADC) pins I plan to make an autonomous robot. I have done something similar with an Arduino before, but wanted to branch off from that to something more powerful. Being that I have never done anything with it before I decided to keep it as simple as possible using two continuous servos for the wheels and a standard servo to look with an infrared (IR) distance sensor.